The KnightsBridge Blue IP67 Waterproof Spool of 12V LED Flex Strip & Rope Lighting is ideal for pelmet, under cabinet, ambient lighting, bathroom and sign lighting. Waterproof LED light strips allow you to fit the strip in locations where resistance to water is required, for example the kitchen, bathrooms etc. It can also be fitted externally making it ideal for signage. 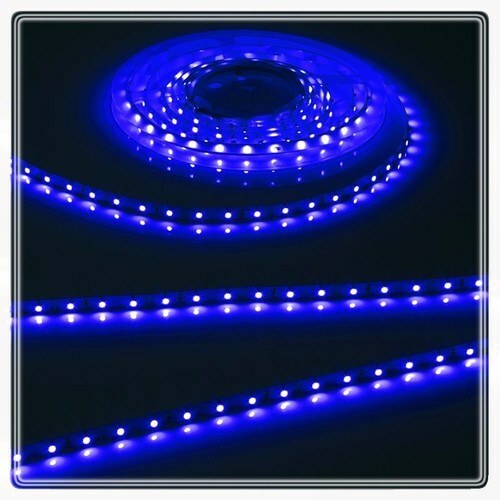 LED Flex is a versatile, flexible LED light strip which can be cut at 50mm (2 Inch) intervals. Off-cuts can be reconnected and used elsewhere. It is a safe, low voltage, energy efficient and draws just 4.8w of power per meter. This power consumption gives it a low working and cool to touch temperature. Its thin profile and narrow width make it ideal for applications where fluorescent or halogen lights would be too bulky or consume too much power. 3M self-adhesive backing is pre-fitted to the LED flex, making it easy to install in areas such as pelmets, under cabinets, shelving areas and for use in mood/ambient lighting. Features 60 super bright LEDs per meter (4.8W per meter ourput). Blue Light Output, matching your needs in a handy and easy to install package. IP67 Rated - Suitable for Indoor & Outdoor use. Sold in 5m rolls however this flex can be cut to the required length up to a minimum length of 5cm. Comes with a 1 year manufactures warranty. This product is also available in a Cool White and Warm White colours. To complete the installation of this product you may require: IP67 Flex Connector Kit, IP67 Fixing Kit Brackets and the relevant driver as indicated above.